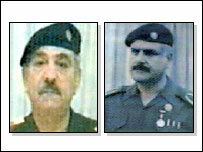 Two more senior Iraqi officials from the coalition's most wanted list have been taken into custody in the country. Mahmud Dhiyab al-Ahmad, former interior minister and number 29 on the list, was captured by coalition forces at an unknown location. And Mizban Khadr Hadi, a member of the former ruling Revolutionary Command Council, turned himself in to coalition forces in Baghdad, US Central Command said. Mr Hadi was also commander of Iraq's central Euphrates region, and reported directly to the ousted Iraqi leader, Saddam Hussein. The two men appear respectively as the seven of spades and the nine of hearts on the now famous Iraq "most wanted" cards, which list 55 of the country's most wanted former government officials. Both men were taken into custody on Tuesday, the US said. The detentions bring to 34 the number of most wanted now accounted for, although confusion surrounds the fate of Ali Hasan Majid, better known as Chemical Ali. Coalition forces said initially that Majid was killed in a bombing raid on his palace in Basra, but US officials have recently indicated that he may still be alive. Those in custody have either been captured or surrendered themselves to coalition authorities. However the whereabouts of the three most important people on the list - ousted Iraqi President Saddam Hussein and his sons, Uday and Qusay, remain unknown. 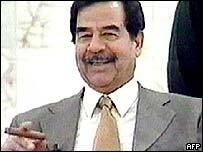 Earlier this month the US offered a reward of $25 million for information leading to the arrest of Saddam Hussein or confirmation of his death. A further $15 million offer was made for similar information on each of his sons. Such rewards have proved fruitful in the past, such as when al-Qaeda suspect Khalid Sheikh Mohammed was seized after US authorities increased the reward for his capture to $25 million. However the $25 million bounty on Osama Bin Laden's head has not prompted further information on the al-Qaeda leader. The most senior Iraqi leader captured so far is Saddam Hussein's personal secretary and close aide Abid Hamid al-Tikriti, who was taken into custody in June.